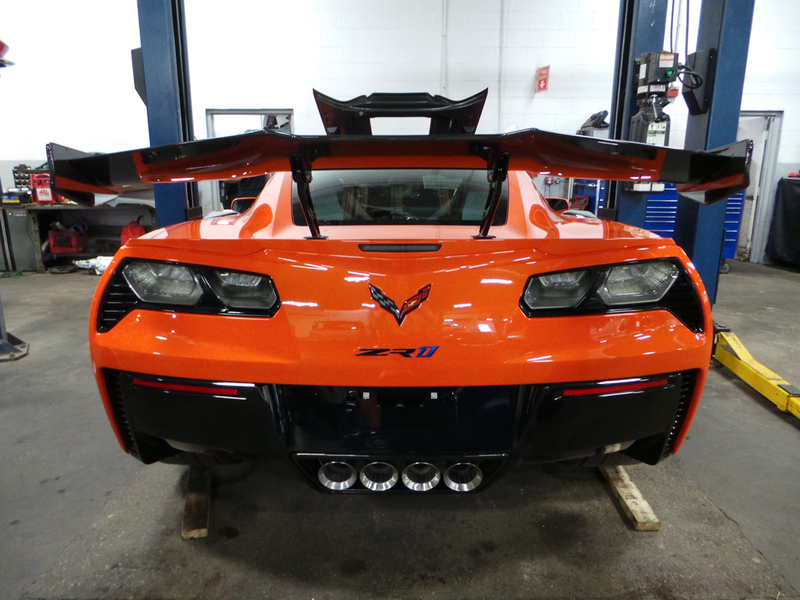 At approximately 9:33am this morning, 2019 Corvette ZR1 Serial #76 arrived at MacMulkin Chevrolet of Nashua, New Hampshire, with its proud new owner standing on the side watching the car being driven off the delivery truck. Dan, the car’s owner has been into Corvettes and muscle cars for decades and I’ve known Dan for many years as a member of Nashua’s “Gate City Corvette Club”. Dan was like a kid in a candy store and I’m not sure I’ve ever seen him so excited to take delivery of a Corvette before. When Dan learned that his ZR1 was picked up at the Bowling Green Corvette Assembly Plant and slated for delivery within the week, he activated his OnStar subscription and tracked the car’s progress from state to state. He was at MacMulkin Chevrolet as the truck pulled up with his ZR1 on the back. Dan watching as his ZR1 is prepared to be driven off the delivery truck. Even Dan’s wife, who doesn’t get excited by cars, was blown away! Although I’m not too crazy about the shade of Sebring Orange Metallic for the 2018 – 2019 model years, the ZR1 is simply stunning! Over the last few weeks, as more ZR1s are being delivered to customers across the country, a ton of photos have been showing up online. Some of the criticisms of the car, include the size of the rear wing, the height of the hood, the exposed carbon fiber under the hood, the orange brake calipers and bronze touches inside the car with orange stitching – part of the ZLZ Sebring Orange Design Package. I’m not a huge orange fan, but I have to say, the entire package looks fantastic. The exposed carbon fiber rear wing and related ground effects looks phenomenal and personally, I like the exposed carbon fiber under the hood, and the hood height…and the brake calipers, and….I love the whole damn car! The quality of the ZR1, both inside and out appears to be top notch and I don’t ever recall seeing a Corvette built with such a high quality, luxurious interior. In 1990, GM managed to take my breath away with the ZR-1. So much so, I ended up buying one in 1994 and still enjoy it to this day. Just before the 2009 ZR1 started to hit dealer showroom, I attended a seminar and walk-around discussion with Corvette Designer, Kirk Bennion and a Jetstream Blue, 2009 C6 ZR1. That car impressed me as well, but not quite to the degree that the C4 ZR-1 did. This new 2019 C7 Corvette ZR1 has blown me away! I could go on and on about this beast of a sports car, but instead, I’ll let the pictures below do the talking. Be sure to click on them for ultimate deliciousness! previous Who Says You Can't Drive a Corvette in the Winter?